One of the most important ratios that I use to track real market values is the DOW/GOLD ratio. Markets throughout history have moved in long term secular cycles. (Usually about 20 years) From 1980 to 2000 we had a long term secular bull market in stocks, and from 2000 to the present we have been in a long term secular bull market for Gold. I expect the DOW/GOLD ratio to cross 7 to 1 in 2009, and ultimately I expect it to become 1 to 1. That will market the end of the bull market for Gold and give a clear signal to buy stocks. The last time the markets received this signal was 1980 when the DOW was at 850 and Gold was at $850. A 1 to 1 ratio. This signaled the end of the previous bull market for Gold and the start of the new bull market for stocks. When banks receive cash from the Federal Reserve it then gives them money to lend out into the open market. This is how banks make money, on the interest on the money they lend out. However, due to the recent collapse of the American economy the banks have been too frightened to lend to anyone. They are just sitting on the cash. A fractional reserve banking system means that when banks take in a dollar of cash, either given to them by the Federal Reserve or deposited by a citizen or company, they can then lend ten dollars out in new loans. This means they only need to keep 10% of the money they lend out on reserves at the bank. (Thus the term fractional reserve banking) This is the system currently used around the world. This failure to lend is what has now led to the Fed bypassing the banking system altogether to inject money directly into the economy. They will do this through purchases of mortgage securities from Fannie and Freddie, corporate debt, credit card debt, and even treasuries. When the banks begin lending again, it will be like uncorking a fire hydrant. So what happens next? Hypothetically, the Fed is then planning on trying to give the banks back all the toxic debt they took off their balance sheets. They are hoping to call them up and ask them if they mind taking all the losses back into their portfolio. Their goal at this point will be to try and slow down the money now entering the system. Will they be able to do this? Of course not. The economy is going to be so much worse 12 months from now that they will not be able to raise interest rates or slow down the banking system which will still be in recovery. A better question is, do they want to do this? Does the American government want a cheaper dollar? Of course they do. We owe about $57 Trillion right now. If that debt is worth less, it is much easier to pay it off. The trick is to convince the rest of the world (and the American public) that they want a strong dollar as it continues to depreciate. They are only trying to prevent a run to the exits. The rest of the world right now is not sending us a loan, they are sending us a gift. The money will never be paid back, it will just be inflated away. The big talk around the news media is the comparison of the current actions of the American leaders/policy makers with the Japanese decisions of the early 1990's. This lead to a period of deflation in Japan, and is one of the primary reasons many economists believe we are now entering a period of deflation in America. However, a brief look back at history paints a very different picture between the two nations. The Japanese public during the late 80's saved their money at an incredible rate, just like many Asian countries do to this day. The country itself was a very wealthy nation, running a huge trade surplus every year leading to an enormous amount of excess savings within their borders. The government's poor decisions at the time were very costly, however, they were paid with the countries OWN savings. Essentially, they could afford to make the mistake. Compare that with our America today. We are the world's largest debtor nation. We run a huge trade deficit every month. Our public has no savings and is deeply in debt. We are making the same policy errors of the Japanese with one major difference. We are broke. Bankrupt. The money to pay for these mistakes is coming from an ever increasing amount of debt and printed dollars. The latter of the two is the difference between the previous Japanese deflation, and the coming American hyperinflation. The Japanese mistakes led to a major slowdown in the economy that they are still recovering from today. Our mistakes are going to lead to the disintegration of our economy that we may never recover from. 1. The first business was inherited by a young man at the age of 23. The father built a strong business with a large cash position in reserve and every month ran at a tremendous profit. However, the young man who is new into the business world made some terrible decisions and squandered all the cash reserves the company had available. The company still runs every month at a profit, however, it is now in some debt and is still trying to recover from the early learning years. 2. The second company was also started by a young man 23 years of age. Instead of inheriting a company, he borrowed $10 million dollars from private investors to get it started. Instead of taking in a profit every month, he runs at a huge loss. In order to keep the company going every month he must continue to find new investors to borrow from to cover his losses and keep the doors open. What would happen if he now made a tremendous business error? Would he be able to recover? The second example may sound familiar due to the recent Bernie Madoff catastrophe. It is called a Ponzi Scheme, and it is the blueprint for the American economy. I spent the past weekend down in Florida for my Uncle's Funeral. The trip started in Fort Myers and ended up in Orlando. My family and I stayed at a hotel right outside of Universal Studios, and after the services on Sunday my father and I sat down together for a drink at the bar. We got some alone time together because there was not a single other person in the entire restaurant. The bartender told us he had been working there for 20 years and he had never seen things as slow as they've been this fall. We noticed as well. My mother and I went to the mall the next evening, and it felt like a scene from Will Smith's movie, "I Am Legend." There was no one there, no one. We did see a few people come and go in the hotel during our stay, but surprisingly none of them spoke English. I asked the lady working at the front desk and she told me that was what was missing this year; Americans. During the 1970's we were dealing with the previous monetary expansion and excess of the past 20 years. Our Fed chairman Paul Volcker decided to take a stand and purge the system of its excess. He raised interest rates to 18% while being spit on by every politician and member of the media. This put the economy into a severe recession in the early 1980's, conquering inflation, and putting most of the unprofitable businesses into bankruptcy. The economy recovered as it always does, stronger, with fresh management and capital ready to invest in the deals that were found at the time. Mr. Volcker left his chairmanship in 1987 to Mr. Alan Greenspan, or the Maestro, as he was known best during his tenure. Mr. Greenspan did not believe in recessions, fighting inflation, or even slowing the economy down. As historians look back on the fall of our great country, he will be sitting at the top of the mountain as the man who was most responsible for engineering its collapse. At every hint of a downturn during his tenure, Greenspan slashed interest rates violently and poured money into the economy. The money supply exploded during the 1990's, hidden from view by many in the stock market bubble that ensued. As that bubble popped in the year 2000, Greenspan slashed interest rates down to a ridiculous 1%, kept them there for years, and once again poured money into the system. The inflation found a new place to hide; the homes of Americans across the country. His reckless monetary policy blew up the greatest asset bubble known to mankind, and its explosion has been deafening. As mentioned before, our economy is a house of cards. We borrow money from foreign countries (or print it), and spend that money on consumer goods such as televisions, vacations, houses, cars, and furniture. We produce nothing of value to the rest of the world, which is why we have a $60 Billion trade deficit every month in spite of having a weak currency. As our spending is contracting, the house of cards is crumbling. In a normal environment these two crisis would lead to interest rates rising, tax cuts focused toward business and production growth, increased savings and paying off debts, government spending cuts and balancing the budget, and a focus toward rebuilding the manufacturing base in our country. This is the absolute worst case scenario. I don't know if this will begin this year, or if it will start in 2010, but once it starts there will be nothing the Federal Reserve or our government can do to stop it. I began talking about the effects of the financial crisis during the fall of 2007 on the Daily Tuna discussion boards. I talked about the effect of subprime mortgages, the CDO's, the bank failures, and the carnage that was coming. However, as it unfolded over the past few months, even I was shocked at the speed it took place. Everything that happened between September and November, I expected to take place all throughout 2009. Why did it happen so quickly? Because investors can move money now at such an incredible pace. Once the dollar begins its final free fall, it is going to be an absolute blood bath, and I don't thing it is going to take longer than a few weeks. The Fed will panic, Washington will panic, but they will be helpless. Unlike the financial crisis and economic crisis, there will be no amount of dollars the Fed can print to revive the currency, and if they try to fix the problem it will be like dumping gasoline on the fire. Merry Christmas to everyone. I hope that my family and friends can open their eyes and see that the world that we live in is changing very quickly around us. You still have time to protect yourself, but that window can close at any moment. I had said on Monday that the Fed would bring us to 0% by the first quarter of next year. Well, you don't have to wait because they took us there yesterday. As shocking as that was, the bigger story was the statement released by the Fed on their future actions now that we are at zero. They have announced a new form of monetary policy known as "quantitative easing." I mentioned that this would be their next step about two weeks ago, but once again they have had the audacity to come out and tell everyone their intentions. The most interesting in their Christmas purchase list is treasuries. They are purchasing mortgage securities in an effort to lower interest rates on mortgage lending and spur the housing market. But Treasury yields are already incredibly low? Why do they need to purchase them? We have reached the long awaited moment when our Fed chairman is literally dumping money from helicopters. 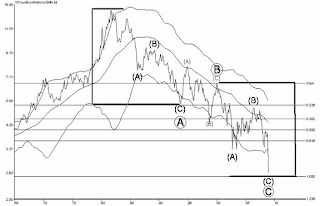 This is the most bearish possible scenario for our currency and our treasury bonds. The Fed chairman knows that we are moving closer to the point of foreigners cutting back on their purchase of our bonds. At that moment it will be the Fed alone that must stand ready to purchase our debt. As mentioned before, if foreigners begin to diversify out of US debt that debt (money) will begin to flood back onto our shores. In combination with this flood the Fed will be hitting the country with a never ending tropical storm of dollars entering the system in the form of quantitative easing. The third storm of liquidity will come from banks who will have once again begun lending with their fresh cash the Fed has given them in exchange for their toxic debt. As the demand for dollars continues to fall, it will increase the velocity of money. This means the speed people will try to dump dollars and receive something of value in return. It will start outside our borders, but as the cost of living begins to rise rapidly here in America people will begin to buy things early in anticipation of it being much more expensive if they wait. This has the effect of intensifying the inflation. The Feds unrelenting actions mean pretty scary times ahead for our country. We are on the verge of the greatest transfer of wealth in human history, a game of musical chairs with the last man holding the US currency out of luck. Unfortunately, that will be the American public who doesn't even know a game is being played right now with their money. Over the past six months I have been warning of "part 2" of the housing market collapse. There were three major kinds of toxic loans made over the past 5 years, and the first one has become a household name; subprime. The other two are called Alt-A loans and Option Arms. These are time bombs waiting to reset, and thus explode, all throughout 2009 and 2010. These loans defaulting will cause massive losses in the banking sector, which is now run by the US government. This means the losses will be paid for with tax increases, borrowed dollars from foreigners, or the printing press. All three either take money from the American public directly or do it stealthily with a loss of purchasing power. Tomorrow our Federal Reserve meets to decide on interest rates. It is widely believed they will cut 50 basis points down to a record low .5%. I would expect to see 0% during the first quarter of next year. Interest rates have become an after thought for the markets, however. The true question is, what will they do once interest rates reach zero? Their only weapon at that point is the printing press, and it will be locked and loaded heading into 2009. It appears central banks around the world are all in a race to 0%. The Federal Reserve will be the first one to arrive, and they will provide the most additional "stimulus" after they get there. This will cause the dollar to lose ground against other currencies around the world, but they will all lose value when priced in gold. During the summer of 2004, I entered the real estate business to start a new career. I was coming out of school at the time and had no idea what I wanted to do with my life, a feeling I think most people feel these days as they left school. I decided to go to work for a home building company and sell homes. I spent the morning every day before work reading about my business and reading about my market in general. At the time we were entering the final stage of what ended up being the greatest real estate bubble in the history of our planet. The headlines, however, talked nothing about a bubble. They talked about the money that people were making purchasing their new homes. People out in California who were buying an averaged price home of $500,000 at the time could expect a 30% return on their home the next year based on the previous year's performances. That meant their home was going to make $150,000. Why would they stay at their jobs? They were homeowners. It was the only real estate market that I had known so I thought that was the way it would always be. The media felt that way. They said it was due to population growth and the strength of our economy. I think about what kids coming out of school think when they read the papers today. A major headline in the financial times this morning read, "Interest rates on US treasury bills turn negative." Negative? That seems odd, they must think. Why would someone lend our government money, and pay the government while they hold it? The media explains it will a familiar clarity. Investors are rushing to "safety." Many kids coming out of school might even think it is a good idea to buy bonds right now. Hopefully, something will not feel right and they might hold off, just as I decided to hold off on purchasing a home in California and quitting my job back in 2004. What a treasury bond represents is the government's promise to pay you US currency in the future. What if you thought our currency would have much less value in the future? Well, the first thing you could do would be to sell your bonds to protect yourself. If you wanted to get aggressive, you could even short treasuries. This would be the equivalent of shorting subprime debt in 2006 if you thought it was overvalued at the time. We'll see what happens. They said house prices could go up forever, maybe bond prices actually can. If this market begins to crack, you better look out below. A lot of people listening to their financial advisers may lose a lot of money. That money may then be transfered into the hands of those shorting the market, just like with housing. I spend a lot of time reading about current market events and different economist's ideas about where we are heading in the future. However, I probably spend just as much time studying the past. After studying previous market cycles, what I find fascinating is investor's psychology throughout the scope of a bull market. For example, during the 1970's in the previous bull market for commodities gold was almost cut in half in 1976, from $185 to $100. Looking back now it was the buying opportunity of a lifetime, and the bull market continued upward to $850 in 1980. During the 1980's there was perhaps the greatest stock market crash in history during October of 1987. The stock market crashed 508 points in a single day from 2200 down to 1700. Most investors were panicked beyond belief, and many were shaken out of the market. The investors that studied market cycles were ecstatic. If you knew that you were in a secular bull market for stocks and they were going much higher you cheered for major sell offs. People who bought in the next morning at 1700 were happy they did 13 years later when the DOW was touching over 12,700 in 2000. That same year marked the end of the 20 year bull market for stocks and the beginning of the current bull market for commodities. We have recently seen a major correction in this commodities bull market that is very similar to the sell off in 1976 and the 1987 stock market crash. Some investors have been shaken off, and some are ecstatic. When gold, oil, silver, agriculture, copper, and cotton fall in price, I do not get upset. It is wonderful. I love it when prices fall. People I know have recently made purchases in commodities and have watched the prices correct during this current period of deleveraging. They are upset and frustrated they are not moving higher. That makes no sense to me. I own a ton of silver. Silver has fallen from $19.50 in mid July down to $9 at this writing. I'm not upset about it, I'm very happy. I was happy buying at $19.50. Now? I'm like a kid in a candy store. I'm leveraging my bets, buying mining companies and ETF's that will perform very well if the prices correct back upwards. I hope silver goes to $2, gold goes to $200, and oil goes to $5. All that will matter when the bull market is over is how many ounces you own, how many oil company shares you own, and how many agriculture, mining, producer shares you own. If you can keep that mindset, then price corrections only allow you to make more money at the end. As if there was ever a doubt in any one's mind that it was coming, the government announced on Friday its new plan to bail out the auto companies. They have started the process with what they call a small amount of short term debt, but we all know that it is the first of a ton of money heading toward Detroit to be flushed down the toilet. The companies can now continue to run their inefficient business models unprofitably as nationalized government entities paid for by the tax payers. Look for billions and billions more to be received by these companies in the months ahead. With that behind us, what can we now look for in the year ahead? It is going to be a very exciting year with major headlines that continue to stream across the ticker. One of biggest announcements of 2009 will be the failure and bail outs of both Bank of America and J.P. Morgan. These companies have loaded their books over the last year with toxic debt to ensure themselves of bail out money that is on its way. As their mortgage and corporate debt continues to decline, the amount of money needed to keep them from failing will be staggering. With the investment banks and auto companies fully supported, who is the next beneficiary of the governments money? Our own states. California announced on Friday that it was now paying out with I.O.U. 's and will be approaching the nation's capital for support very soon. They will be the first of many, as states all across the country move closer toward failure. They will all get the money needed. Up until now we have seen a very defensive strategy in dealing with our economic crisis, moving from one bail out to the next trying to put out the fires. I think to finish this year and start the next we will begin to see more offense from the Fed and Treasury. Banks around the world are now flush with cash that has been dumped on them by central banks. The problem is that they are all too afraid to lend to each other, businesses, and consumers. This poses a major problem for the Fed and other central banks because it is not increasing the money supply fast enough. When banks receive money from central banks, they only need to keep a small portion of that money in reserves. (Usually 10%) This means for every dollar a bank receives they can lend out $10. This has the effect of greatly increasing the money supply, which is not currently happening due to their fear and cash hoarding. So the Fed will move to step two, which is a process called Quantitative Easing. (Something you will hear a lot about in 2009) What this means is that they will bypass the banks and just start injecting the money directly to businesses and consumers. They have already started doing this with their use of Fannie Mae and Freddie Mac. By buying their toxic securities in exchange for cash they are essentially giving money to homeowners as that new money can now be lent out. This will be a major part of their new "interest rates to 4.5%" program. The second part of that was the recent announcement of $200 Billion in credit card debt purchased by the Fed. This allows credit card companies to give new money to American consumers. A third step, and very similar to the last two, will be the direct purchase of corporate debt. The goal here will be to stimulate business spending which has shut down as everyone has been hoarding cash across the board. All of these plans will have the effect of printing money and entering it directly into the economy. Along with the Fannie/Freddie and mortgage purchases from the Fed, I would look for a major new program to restructure mortgages. Currently 1 out of 10 homeowners are not paying their mortgage. Where will the money come from? That's not important yet. You probably won't see that question on the front page of any newspapers in 2009 because people will be focused on bail outs and the government saving them. 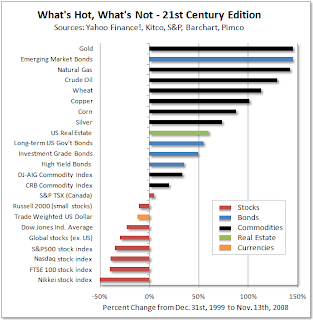 I don't think it will be front and center until we start 2010 and the real crisis presents itself; our currency crisis. Either way, it will be fun to watch how long the herd will rush into treasuries before they stop, look around, and realize they have just run off a cliff. What is wrong with the car you have now? 1. Home Prices - The Case/Shiller Homes price index registered at 17.4% decline in September and that number continues to pick up speed. Home prices continue to plummet as we continue to deal with the subprime problems. Up next will be the Alt-A loan tsunami followed by the last stage of the housing meltdown which will be people walking away from homes that are not underwater. Why? 2. Job Loss - The unemployment numbers came out this morning and they were horrifying. Over 530,000 jobs lost last month, going by the governments rosy picture estimates. This was the worst month since 1974 and unemployment continues to grow. 3. Economy Indicators - The Empire State, Philly Fed, Richmond Fed, ISM manufacturing and service indicators are not indicating a recession or even a depression. They are indicating a full blown economic collapse. These numbers will pick up speed to the downside as we continue forward. 4. Consumer Sentiment - The consumer sentiment is so low right now there is nothing even to compare it to. People are walking around like zombies right now trying to understand what is happening to our economy. Many are worried, most are afraid. I talk about things like depression and economic collapse, and I want to put that in context. What that means is the American standard of living is going to be reduced dramatically. That means that when people want to buy something they are going to have to save for it. But let's stop right there for a second. If Americans were not allowed to buy anything new for the next two years, would it really be that terrible? Do we all need new cars, and homes, and furniture, and clothes, and washing machines, and computers? Couldn't we just use the ones that we already have? People wouldn't be living in poverty, they just wouldn't be living in la la land. When I say economic collapse, I don't mean we're going to have dirt roads, and bicycles, and shacks. We're just going to have a drastically lowered standard of living from what we have now. There are benefits to this. People are going to get a lot closer to their family and friends. They'll have to stop for a second when the free gifts are taken away and think about the important things in life. We're going to have to come together as a country and try to rebuild it. We're going to have to start to work hard, save money, and produce goods. I'm looking forward to the collapse of the stock market, bond market, our currency, and our bubble economy. I can't wait for the day when I can get excited about investing in the United States, and I can look people in the eye when I tell them it is a strong investment to own a home in our country. People say that talking bad about your economy means you're not a patriot. I disagree. I think speaking up against people destroying the country is like yelling at your kids if they take drugs. It feels good to print $8 Trillion dollars and run $2 Trillion deficits, but for every cause there is an effect. The effect is on its way, and it is exactly what this country needs to sober itself up. I would like to try to explain a concept that I refer to a lot on this site. It is the United States exporting inflation to the rest of the world. A Chinese boat pulls up to a docking port in New York City to unload its cargo. When the cargo is dropped off the American then pays the Chinese worker with American dollars for the goods. The Chinese worker then drives the boat back to China and deposits the American dollars into his account and the bank exchanges them for the Chinese Yuan (Chinese currency). The local Chinese bank now has a glut of dollars and a shortage of Yuan, so it exchanges the dollars with the People's Bank of China and buys more yuan. You can think of the People's Bank of China as their Federal Reserve. China then must decide what to do with their dollar reserves. This decision is the most important factor guiding our global economy. One option would be to exchange the dollars on the foreign exchange market for yuan. This would increase the demand for yuan considerably and cause the value of the currency to rise. When a currency rises in value the American worker at the New York City port now has to pay more dollars to purchase the goods and services. At the same time the Chinese worker on the boat can spend a few hours in New York while he is visiting and purchase American goods real cheap because the value of his yuan is so strong. The Chinese (right now) do not like this strategy because they do not want to hurt their exports, which is what a strengthened currency will do. They have decided to take the excess dollars received and purchase American assets with the dollars, most notably US Treasuries. This has the effect of "neutralizing" their currency inflows and keeping their currency artificially suppressed. It has another effect which is the rise in value in US assets such as the bond market because of the increase in demand. Sounds great right? There is one problem. When the Public Bank of China exchanges yuan with the local bank for the dollar, where do they get the yuan? Ah, they print the money or create it with a computer. You remember that trick right? This money has poured into the local banks creating an explosion in the Chinese money supply. This explosion has caused inflation to rise tremendously. The cost of living is rising at a very rapid rate hurting their developing middle class. They do this (right now) to keep the yuan artificially low and keep the dollar artificially high. This situation is unsustainable and will come to an end. The rest of the world will not suffer forever to pay for our excess. When the dollar begins to crack, they will send all those accumulated treasuries back to our shores, bursting our current bond bubble, and triggering the collapse of our currency. Interesting speech yesterday from our great policy leader Mr. Helicopter Ben Bernanke. On a day when the markets were ravaged, he announced to the world his plans on bringing as much destruction as possible to our country in the future. When asked about interest rates, he said that is was feasible to cut below the 1% Fed Funds rate. This means you can bet the house that interest rates are heading toward zero. That means free money for banks. Free. Not only that, but he followed up with additional measures to support the economy. His eyes lit up when talking about additional liquidity injections coming down the road. He even had the audacity to say he has plans to purchase treasuries directly. I have been talking about the Fed purchasing treasuries as the final step in our destruction as foreigners stop buying, and he is already talking about doing it now. In previous discussions I said that the Fed has declared war against our currency, and that doing so would greatly diminish the purchasing power of American's savings. I was terribly mistaken, and I apologize. What we can look forward to now is a nuclear holocaust. As we enter the final month of 2008 we are winding down one of the greatest periods of deleveraging in history. Hedge funds, investment banks, and major portfolios of all types have spent the last 90 days selling every asset in their portfolio and replacing it with cash and short term treasury bonds. They have sold assets whether they were good, bad, rational, or irrational. As the smoke continues to clear around the world from the credit crisis bomb that was dropped on the global marketplace, the rest of the world will realize that they still have productive economies and that they will continue to grow and produce goods. They will need industrial metals, oil, food, etc., and the artificial prices that are seen today due to the deleveraging process will disappear and begin to move much higher. The second part of this story will come with the falling dollar that I was discussing above. When the dollar falls, commodities become more expensive. The biggest beneficiaries will be oil producing companies, and miners, specifically precious metal miners. I would expect their returns to dwarf all other assets in 2009. Not all foreign stocks. I would be looking at stocks that have no relation to exports to the United States, and I would also stay away from foreign banks in the short term. Both those groups will continue to experience pain as the United States collapses. However, there are an abundance of foreign companies that will feel little to no effect of the US collapse and will benefit as the rest of the global economy continues to push forward. In the past three months, just like commodities, many of these stocks have been irrational sold due to the forced liquidations. They will lead the rebound not only because of their attractive pricing, but because of their strong dividends. Investors will look closely at a 13% dividend from a safe Asian water producing company, over a .02% yield on a bubble treasury bond. The dollar's recent artificial rise is like a roller coaster rising on the final crest. To me, this means the opportunity of a lifetime for long term investors to exit poor positions and enter others. It seems as if we're entering a calmer period in the market place and will most likely be in that period for the foreseeable future. The Fed and treasury have effectively taken the financial system collapse off the table with their recent actions of nationalizing every bank and now looking to continue purchase trillions of dollars in toxic debt. The underlying debt that they are purchasing will continue to lose value as home prices fall, credit card, student loan, and auto delinquencies rise, and corporate debt defaults. With the "no one fails" system in place, it will take trillions more to cover the continuous losses that will pour in over the next year. The money needed for the continued bail outs will come from printed money from the Fed and borrowed money from foreigners. This will continue until the United States as a nation collapses under its own debt and declares bankruptcy. How long will this take? Probably at least another 12-18 months. During that period we will continue under the same macroeconomic paradigm that we have for the previous 20 years. That is the rest of the world living below their means, saving, and producing goods that they send to us. We then purchase those good with borrowed money from them and now printed money from the Federal Reserve. Most economists feel this will continue on for many years into the future because our debt to GDP ratio is still very low compared to most other countries. What they fail to realize is that 72% of our GDP is consumption which is going to vanish without the ability to borrow. This is happening as we speak with home equity lines being pulled across the board, and news this morning of credit card companies pulling back $2 Trillion in credit lines. When Americans are no longer able to borrow and spend the system will begin to break down. Our GDP will then collapse and be seen for what it really is which is just smoke and mirrors. Foreign countries will then see our debt levels at their true horrific values, and proceed to slowly cut off our credit lines. This will leave only the Fed as the money source of last resort. At this point the Fed will be buying treasuries, mortgage securities, credit card debt, student loans, and auto loans. Trillions and trillions and trillions will continue to enter the system. Somewhere during the year 2010 the house of cards will begin to topple and we'll begin to experience a hyperinflationary depression. In the near term, however, I expect to see the recent trillions of dollars entering the system to continue to have a calming effect on the markets. Under the surface, however, the losses will be real and continue to grow. They will just be temporarily covered with printed and borrowed money, but as the great Warren Buffet has said, "once the tide goes out you'll be able to see who was swimming naked." Fannie Mae and Freddie Mac were nationalized in August, and while that was horrific enough standing alone, I said at the time that the real horror would come in the government's new uses for the two mortgage giants. News crossed this morning of a new program from the Federal Reserve to buy $500 Billion in mortgage backed securities from Fannie and Freddie and another $100 Billion of their debt. This is just the first buyback of many to come, but what does that mean to the real estate market? We created a bubble in real estate because lenders were essentially allowed to make a home loan to anyone. This allowed more entrants into the market and more importantly a lot more speculators. Lenders could lend this way because they immediately sold the loans into the secondary market, and the secondary market then packaged those loans and sold them to the world. The problem is that a very large portion of those loans are now going bad and investors around the world are taking tremendous losses. In a sane world, that would mean that they would not buy any more mortgage securities at the current bubble prices that Americans cannot afford to pay. That would mean that lenders would have to keep the loans on their books, and they would have to make only loans they felt would be safe and would not default. This means homeowners would again have to put down 20%, have a job, ect. In order for homeowners to be able to do that home prices would have to collapse back down to an affordable level. That is the way a free market works, but the government will not let the natural market forces work. What will happen now is that lenders will continue to make loans that are bad as long as they have the ability to immediately sell those loans to Fannie Mae and Freddie Mac. They are currently the only ones left to buy the toxic debt at bubble prices. The problem is that Fannie Mae and Freddie Mac now have to figure out a way to unload that toxic debt off of their balance sheet. The new Fed program provides the answer. They now buy the toxic debt and print new dollars to exchange with Fannie and Freddie. I was watching CNBC this morning and they were laughing and smiling and one of anchors asked the other, "What comes after $999 Trillion, so we know what to call it when the bail out gets there?" The other one laughed and said I think it is a quadrillion. The laughing will come to an end probably somewhere around 2010 when they realize what a trillion printed dollars does to a currency. Some people will be laughing, it will be the ones that understand today what effect it will have on our future. When you hear these two statements from a CEO of a major investment bank you can immediately know that they are in serious, serious trouble. Citigroup has been all over the news this week with these announcements and I told a few people that I would be ready for some bail out news as early as this weekend. I even guessed the time the news would be released. 1:00 PM on Sunday. How did I know? It happens the same way every time. I was even joking that maybe they pick the time because they are hoping people will be distracted with football and will be less likely to notice. A few weeks ago I said that both Citigroup and Wells Fargo were in a war to acquire Wachovia because taking their bad debt on their books would make them too big to fail. They had this mind set because the government had let Lehman fail because they thought their impact would be minimal to the markets. They were wrong. Wells Fargo ended up taking on the bad Wachovia debt and Bank of America then acquired all the bad Merrill Lynch debt. This now made them too "big to fail", or nationalized. Fortunately for Citigroup, Lehman's failure and market consequences has now made it clear to the government that they will not let ANYONE fail under any circumstances. All the banks have now been nationalized, and all would be insolvent without the new government guarantee. They will now get an unlimited amount of dollars to keep their bad operations running. The same is true for the auto manufacturers, but not for the reason that many are talking about. The auto manufacturers failure would trigger massive losses in the credit default swaps market on their corporate debt, which would in turn trigger additional massive losses onto the banks balance sheets, which would trigger additional bail outs. As the losses pour in hour by hour, we move closer to the point when the United States debt will be downgraded. Right now our treasuries are trading at AAA credit, just like subprime debt was trading at AAA in the fall of 2007. The similarities are eerie, and the outcome will be the same. The United States is currently on life support from foreign countries just as the investment banks are on life support from the United State government. When the rest of the world figures out that the "AAA" treasuries they are holding are actually junk bonds, the bubble will explode and its impact will be deafening. I have advised a few people who have come to me for advice on how to purchase precious metals to use the Perth Mint program in Australia. This is one of the largest mints in the world, and I liked their program based on their low costs and their ability to store the metals outside of the country. Today I found out that their window to purchase has now closed as they have suspended all orders for metals until January due to the overwhelming amount of orders taken over the past few weeks. They cannot keep pace with demand. 1 ounce physical Silver Eagles averaged $27 an ounce today in the open market, while the paper COMEX price can still be purchased for $9.60 an ounce. At some point those prices must once again be equivalent. You can take your bets today on which way you'll think it will go. In the headlines today you read about the credit card defaults soaring, auto loan defaults soaring, foreclosures soaring, and you're still hearing about the subprime loans getting worked through the system. All these things continue to destroy the major investment banks balance sheets. In about six months, as the subprime loans and foreclosures have brought our nation to the brink of bankruptcy, the true atom bomb and possibly the final bomb will be dropped in neighborhoods across the country in the form of the Alt-A mortgage loans. These loans were given not only to people with no credit, no income, no assets,(subprime) but they were also given to the mainstream, the prime buyers. They provided home owners a monthly choice of paying their (A) full payment, (B) paying interest only, or (C) paying less than the interest payments and having the remainder added on to the total principle every month. You just checked A, B, or C every month and sent in your check. Which option do you think the majority of Americans chose? Well, we'll soon find out. Starting next year the first wave of interest rates resets will begin for the Alt-A loans and they'll continue all the way through the first quarter of 2011 like a never ending tsunami. Imagine as homes are falling in value every month and begin to go under water that at the same time principle is being added onto the total amount owed. What is the likelihood that those people are going to continue making their payments on the underwater homes when their payments reset and they now have to pay principle AND interest on a larger principle AND a much higher interest rate. It's going to be a disaster coming at the same time the cost of living is exploding, people are losing their jobs, stock prices are falling in true value, and home prices are collapsing in true value. I say "true value" because you will eventually see a rally in the nominal stock price due to the inflation currently being injected into the system. I would expect to see a few major bear market rallies in the stock market over the next few years that will be spectacular. These will present tremendous selling opportunities for anyone still holding American stocks. These temporary and artificially inflated stock prices will not buy anyone any more goods, but they'll make people feel better when they look at their statements every month. As I have discussed in the past, the "paper" precious metals markets are currently being artificially pushed lower with enormous short positions by major investment banks. This artificial suppression has created a disconnect between the paper price of the precious metals on the COMEX and the real physical metal price of the metals being sold outside of the COMEX. There is no major market medium that can track these prices at a non-COMEX spot price, but in the recent headlines you can read stories of extremely large purchases of the very wealthy over the past few weeks making purchases at huge premiums over the current artificial spot price. For example, the price of gold has been trading in the $700's for the past month, but a few weeks ago there was an enormous purchase made overseas for around $1100 an ounce. The only real physical market that can be tracked outside of the artificial paper market is Ebay which is a global network found in just about every major country in the world. Unfortunately with Ebay there has not been a system put in place to track what the average price is paid per ounce on its website. A company called 24 hour gold has put together a program to track the daily average for gold and silver purchased on the free market. I have placed the links to left of this page, making it easy for you to access at any time. Gold is trading around $950 an ounce in the free market depending on the size of the purchase. Silver is currently trading around $18 an ounce for large amounts and over $20 an ounce for smaller amounts. "All Bullion Products are shipping 12 -14 weeks from the receipt of good funds with the exceptions of Silver and Gold Canadian Maples,Silver and Gold American Eagles and Silver Vienna Philharmonics which will be available for shipping in March of 2009." 14 Weeks or March of 2009! This will continue until the COMEX defaults on its paper contracts, or the paper price aligns with the real price. Remember, this is all happening with the dollar strengthening in value over the past few weeks. Imagine what things will begin to look like when the dollar begins its final collapse downward 80-90%. 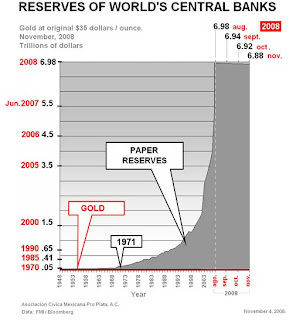 Imagine what it will look like when the public first begins to turn to gold and silver for safety like they did in the late 70's, except this time they find out that there is no gold and silver available. Right now there is a 14 week wait to take delivery and 99.9% of the country has 0% of their portfolio allocated in gold and silver. What would happen if they allocated just 1% of their investments into the metals? Total cost for this is at $4.284 Trillion. That's much greater than the inflation adjusted cost of WWII by over $600 Billion. This is just for what we've spent on the financial crisis, this does not include our regular budget deficits which are exploding. We are not using this money to protect our country in a war. We're using this money to try to help investment banks that made terrible investment decisions. Would things be bad right now if we were not protecting the banks? Yes, they'd be horrible. Home prices would be collapsing, the stock market would have been decimated, the bond market would be falling, and our currency would be getting crushed. Unemployment would be very high and Americans would have to do the unthinkable: stop spending and start saving. It would probably be bad for about 24-36 months and with the proper leadership home prices, the stock market, and our currency would find a bottom, and we could begin to rebuild the country with a new focus toward production and saving. We could begin to move toward exporting goods to the rest of the world in receipt for what they send us. I've spent the last four years studying under some of the most brilliant minds in macro-economics. Those economists over a year ago had a clear vision of the bank failures and economic collapse we are experiencing today based on previous decisions/mistakes made by our leaders. At the time they could not see what would come next because they could not see the response our leaders would have to the future crisis as it unfolded. It is now unfolding and our leaders have left no doubt in any one's mind how they plan on handling our current economic trouble based on their actions over the past 60 days. So what are those same economists saying now? They are advising putting together a plan on physically removing yourself from this country if necessary. That sounds as ridiculous now as it did a year or two ago when they explained why we would be experiencing the economic troubles we are now. Please understand that there is no longer going to be a very rough landing for our country. It is going to be destroyed, decimated. The decisions being made today are going to turn our country into a wasteland. The American public is going to be wiped out, and it's going to be an absolute tragedy. A friend of mine purchased physical silver for the first time yesterday. He spent the afternoon calling around to local precious metal dealers. Time after time they told him that they were no longer planning on being involved in the silver business. His first reaction was that it was because the demand dried up due to the price falling so sharply over that past few weeks. "Not at all," was their reply. They could not find silver anywhere, and when they did receive it there was an order there waiting for its arrival. He decided to call a national bullion dealer and make his purchase over the phone and have it shipped to him. His wait time? 3 months. Many dealers are being forced to push back their delivery dates to March of 09'. Three major banks currently have 80% of the ENTIRE silver short position on the COMEX. If a large number of investors decided to take physical delivery over the next 60 days the COMEX would default on its silver contracts. Will that happen? Maybe, maybe not. But it'll sure get interesting if it does. So what does a bond bubble mean? In simple terms it means interest rates are going to rise. Imagine you own a $1,000 30 year treasury bond yielding 4%. This means you lend the government $1,000 and every year they will pay you $40 for 30 years. At the end of 30 years they will pay you your $1,000 back. If treasury bonds become attractive to investors and more people are buying them, then the yields drop. This is because investors are willing to take a lower return on their money. This means that if you bought a $1,000 bond at 4% and now the same bond is priced at 3%, you can sell your bond in the open market for more than what you paid. This is because new bonds are now only paying $30 per year with the 3% yield. To give that same return of $30 per month to a new investor you can charge more for your bond. The opposite is true if interest rates rise. This means the value of the bond falls. No one will buy your $1,000 bond yielding 4%, when they can just go to the government and buy a $1,000 bond yielding 5%. In order to sell your bond, you must sell it for less than the $1,000 you paid to make it attractive to a buyer. Right now investors around the world are running toward US treasury bonds for security. This has pushed interest rates to ridiculously low levels. These yields are short term and artificial creating a massive bubble. Foreign countries at some point will become net sellers of treasuries into the open market. This will come at a time when the government is selling treasuries to raise money to pay our enormous budget deficits and tries to stimulate our economy as it collapses. This will raise yields on US treasuries, which remember, raises the amount the US has to pay on its new debt and its short term debt that is rolled over. (Think of an adjustable rate mortgage) It will be unable to due this which will in turn make it more dangerous to borrow from the US which in turn will raise the interest rates even higher. This will further depress the value of our currency thus making US bonds less attractive and pushing rates even higher. It will be a self reinforcing death spiral. The last option will be for the Fed to purchase treasury bonds to try to keep the bond market from collapsing. They will do this with printed dollars which will be flooding our economy at the same time all of our dollars currently being held by foreigners are coming back to our country as they redeem their treasuries which are becoming dangerous to hold. Investors holding dollars bonds will be killed. Of course you don't have to sell your bonds, you can keep collecting your 4% interest over the next 30 years as inflation is running between 10-20%. The only thing worse than holding dollars will be the promise to receive dollars in the future, which is what a bond represents. Right now we are dealing with a short term financial crisis, but keep your eye on treasury bond yields as they will be the catalyst for our long term economic collapse. Any rally in the stock market provides a strong selling opportunity and any pull back in the commodities market provides a strong buying opportunity. The same goes for bonds as their recent strength will subside and their values will fall off a cliff. The real estate market is plummeting and has a long, long way to go before reaching a bottom nationally. It's interesting because many homeowners still have an opportunity to sell their homes and receive some of the artificial paper wealth created during the bubble years that will soon be erased. The reason for this is because it is still a "stigma" in this country to be a renter. People would rather own a home that is falling in value that costs them significantly more money every month because if you are a renter you are considered lower class in our country. That will change over the next few years. As prices continue to collapse, people will begin to look at homeowners the same way they now look at renters. This moment will likely mark the time to look at real estate as an investment because the increase in sellers who become renters will have the impact of driving home prices down and driving rents higher. The will generate cash flow opportunities for investors entering the market. Our treasury secretary announced mid summer, when things were very calm relative to where we are now, that he would be guaranteeing the debt on Fannie Mae and Freddie Mac. He told the country that this is not a cause for concern because just by guaranteeing the debt it would mean that no money would be necessary. Two weeks later he announces that the companies have been nationalized. Hundreds of billions have been poured into the companies to cover losses and hundreds of billions more will be needed. About a month ago he lined up in front of Congress to ask for the TARP program. He told our leaders that he would need a blank check for $700 billion but far less than that would be needed. The goal of the TARP program was to buy mortgage securities from banks at attractive prices to make a market for these securities. Once the government started buying them, then everyone else would, and banks would start lending again. The government could then sell those assets back into the market and make a profit for the taxpayers. A week after getting his blank check, Paulson says he must first send the investment banks $125 billion in direct cash, momentarily pushing aside the original plan. The next day he announces that he will send another $125 billion directly to smaller banks once again pushing back the original goal of the taxpayers money. This morning it was announced that the government may now buy zero mortgage securities with the money. None. This means they have done nothing to help the credit markets other than send hundreds of billions of dollars to banks who are now just sitting on the cash to cover losses. With the wiff of what is going on, lobbyist have lined up in front of Washington to take a piece of the bailout pie. Companies in all shapes and sizes are now standing in line to get some free money. To counter that ongoing insanity, they have also redirected focus toward modifying additional home loans. Any outcome from this is going to be a disaster. Any home owners that are still making payments that can qualify for the new program will immediately stop. Many will come up with ways of rearranging their finances to qualify for modification. This will have a horrific effect on our economy as a whole. In order to pay for the ongoing bail out support, I would keep your eyes open for new government programs to raise additional money. One such program may be to have 3-5% deducted from workers pay checks that would be placed into an "investment fund." The government would tell the country that they will be helping them invest for their future and the money will be returned with a strong return. The money, however, will immediately be spent and replaced with treasury bonds. (IOU's) This is the way that medicare and social security work when it is deducted from your pay every month. The government spends that money instantly and replaces it with IOU's. It is important to remember the final outcome of all this, which will be the collapse of our currency and our country declaring bankruptcy. We move closer to that point every day, and the majority of Americans will have their entire life savings wiped out in the blink of an eye. Not in the amount of money they have, but with what that money will purchase, their true wealth. 10 short years ago the markets were gripped with the panic known as Long Term Capital Management. LTCM was a hedge fund that was the darling of the industry throughout the 90's. They were the brightest minds in the world in risk management and every major bank in the country was sending them billions of dollars to invest. They were betting on risk spreads between bonds of different nations and after growing confident over the years they were leveraging their bets up to ridiculous levels. They would collect massive checks year after year as long as there was not some "event" that would shake the markets. Of course, that event came as it always does, in the form of Russia defaulting on its debt in the summer of 1998. Long Term Capital Management was leveraged up so high that they turned to the Federal Reserve to bail them out because they represented systemic risk to the financial system. The Fed did just that, but the unwinding of their trades caused enormous shock waves through the credit markets, stock markets, and commodity markets. Oil fell from $20 all the way down to $10 a barrel. The media cheered of the bursting of the oil bubble. To start the new year in 1999 the Economist magazine ran on it's cover that the price of oil was going to $5 and staying there for the foreseeable future. What was the reason? Demand Destruction. Soon after the price of oil was announced to stay cheap forever, auto manufacturers created the wave of the future in SUV products that rolled off the assembly lines. Gas guzzlers if you will. When the entire world was buying tech stocks in 1999, a small percentage of investors began buying oil companies due to the forced selling in the trading pits. They have done pretty well over the past ten years with those companies. The tech stocks? Well, we know that story. I believe the next 5 years will have a similar story to the last ten. Oil touched $59 today. Unbelievable. Everyone is cheering for $20 oil, and cheap oil forever. The Demand Destruction has arrived. Or has it? Worldwide demand is on pace to grow this year, and recent depletion studies are showing a 9.1% annual decline. SUV sales have risen sharply as buyers are picking them up at discounts hoping that oil will stay low. I'd rather buy oil stocks on discount, but time will tell who is making the right choice. It is pretty much a consensus at this point that General Motors "must" be saved. Letting them fail would cost hundreds of thousands of jobs in countless industries across the country. Of course we can't have that right? Wrong. GM is failing right now because it is a bad business. It has overpaid employees and terrible management. What would correct that? Bankruptcy. The government sending them money every year is just propping up a terrible business model. If they were allowed to fail, it would initially cost hundreds of thousands of jobs, yes. I agree. But what would happen then? GM would still have assets that would be bought by a new investor. That new investor then would come in and design a better business model for the company with better management without ridiculous pensions, labor costs, ect. The people would then have work again, it would just be at a much lower pay. If they don't like the pay, they can go work for someone else. Why should we pay for their salaries? We already pay everyone in Washington's ridiculous salaries. No one ever thinks about that though, they only think about the immediate impact they see in the jobs losses. You have to be able to see two steps down the road from a decision. If our government cannot do that then we will continue to fail as a nation. This weekend China decided to join the party in stimulating their economy. They are preparing a $550 billion stimulus program. I guess they are in a similar situation as us, right? No, it's almost exactly opposite. China has $550 billion SAVED. They run a massive trade surplus every year that mostly comes from the USA. Our $4 Trillion stimulus comes from printing money and borrowing from foreigners. We take that money and throw it away on banks, auto manufacturers, credit card companies and Fannie Mae to stay solvent. China is using the money to invest more in their countries infrastructure. They will invest in new factories and tax cuts for business growth. Can you see the difference between the two? It is very important that you can. Do not let the daily headlines numb you. The trillions of dollars that are being printed will be accounted for. The trillions of dollars that are being borrowed will be accounted for. Who will do this accounting? Gold will. And more specifically the dollar will. Probably not tomorrow, and maybe not this year. Every day that passes means the correction will be bigger when it comes. "US debt grows exponentially and the country may file for bankruptcy." Warren Buffet, the richest man in the world and the greatest investor of all time, has recently moved 100% out of his wealth out of US treasury bonds. 100%. He understands what is coming. Bill Gross, who manages the largest bond fund in the world and is considered the greatest bond trader of all time, has recently announced he is moving substantial holdings away from US treasury bonds. He understands what is coming. Commercial banks are taking massive short positions right now on the US dollar. They know what's coming. The super rich around the world are making massive purchases of physical gold and silver. They understand what is coming. The Federal Reserve stands ready to print money with NO LIMIT, and while everyone is talking about bailing out GM, no one talks about who is going to bail out the US. We received the the unemployment numbers this morning that said that we are currently running at 6.5% unemployment and have now lost over 1 million jobs this year in America. What was shocking to me was how incredibly understated these numbers still are. Just like the Consumer Price Index that measures inflation, the unemployment numbers have been changed over the years to represent a much rosier picture. This is not some conspiracy theory, they have come out and told us how they have changed their calculations. The top line shows where we are currently running through the end of September at around 14.5%. The number will be higher when he releases the October information. Anyone who lives in the real world knows that this is the true number, and it is only a matter of time before the country stops paying attention to the government's phony information. It shows the reserves of foreign central banks. Just about every week I have talked about the US economic bubble ending when foreigners stop purchasing our worthless debt. As you can see from about 1971 their accumulation of our debt has increased exponentially month after month. To many people this means that it would go on forever. Something interesting happened in August of this year. The amount purchased hit a wall and has actually started falling month over month since. Could this mean they have finally figured out our con? That they work hard every month to send us money that we use to buy things? Maybe. Maybe not. But if they have, that means we will then move to step two of this process, which is monetizing the debt. If foreign countries will not finance our lifestyle then we will have to do it ourselves with printed money. Recent charts I have posted show the Fed's balance sheet exploding upward. There are two important factors to remember concerning inflation. The first is the supply of currency (dollars) printed into the system. I talk about this relentlessly, but what I talk less about is the demand for those dollars which is equally as important. For example the recent rise in the dollar index has come at a time when dollars are entering the system at a blistering pace. But because of the recent deleveraging, there has been a short term rush toward dollars increasing demand tremendously. What will eventually happen is that when the foreign countries stop buying our debt, which may be happening right now, the demand for dollars will fall through the floor. This will come at a time when the Fed is monetizing our debt, meaning they are covering all the bad loans with printed money. They will be flooding our system with dollars at the same time foreigners are sending all their dollar reserves back to America. Supply exploding, Demand collapsing. These steps will combine with the third and final step. Americans are currently saving money because of the economic hardship. (A good thing) When they begin to feel the value of that currency falling, they will begin to purchase items faster because they feel the items will rise in price if they wait. This will flood the market with additional currency creating the final leg of the perfect storm. I use the term hyperinflation a lot, and these are the steps that will unfold to get us there. The dominoes have been put into place. All it is going to take is a small push to start the process. News crossed the wires this morning on Bloomberg that for the first time in 15 years the month of October saw no purchases of bonds backed by credit card debt. Zero. How much was purchased last year at this time? $17 Billion. In the same fashion as housing loans over the past few years, credit card companies sent credit cards to every American in the country with a pulse. They told them to spend away with almost no limits. When the Americans started to spend, the credit card companies then bundled that debt into bonds and sold them into the market to investors. (Foreigners) This allowed them to continue to increase the amount of debt without keeping it directly on their books, and the amount of debt surged. Now, the debt is starting to default, just like home loans. This has spooked investors who buy those bonds in the open market. This means if a credit card company wants to offer credit they have to take that risk on their books. Obviously, they will not do that because they know they are lending money to Americans who cannot pay it back. When you send the debt to someone else for it to default on, it is much more attractive. What you'll begin to see now, as an example, are statements arriving in the mail telling you that your credit limit has been reduced from $5,000 down to $500. You'll begin to see a lot less cards arriving in the mail telling you that you are instantly qualified. This will not happen tomorrow, but gradually over the next few months. This will be a crushing blow to Americans who now depend on the credit cards to cover the difference in the cost of living every month. More and more loans will begin to default, and the market will continue to tighten. In response to a tightening of lending standards for home loans to Americans, (the free market working) the government nationalized Fannie Mae and Freddie Mac. Will they do the same with the credit card companies and stand behind all their debt? If they do not then the end of our spending binge may finally be over, and our country can begin it's true economic collapse. GM announced yesterday that they will know in the next few months if there will be an American car industry at all. The government has the same decision to make with the auto manufacturers to decide if they will stand behind their debt. There are two ways to make money in commercial real estate. The first is to increase income and decrease expenses. The second is appreciation to your building based on the market's desire to own your property. Seems easy right. It is. But what I've found in my last few years of study is that commercial real estate is very similar to texas hold-em. It is very easy to learn, but it takes a lifetime to master. Similar to a no limit high stakes game of poker, the smallest mistakes can wipe out your stack in an instant. For example, let's say that the annual income on your building is $200,000 and your expenses are $100,000. That leaves you with $100,000; this is called your Net Operating Income. All you have to know at this point to understand what a building is worth is to know what rate of return an investor is willing to pay for that $100,000 in Net Operating Income. If an investor is willing to accept a 10% return on their investment, then your building is worth $1,000,000. The 10% is called a cap rate. Cap rate and Net Operating Income are the two most important terms in commercial real estate. They are similar to "implied pot odds" and "number of outs" in texas hold-em. If the cap rate is still at 10%, then your building is now worth $1,200,000. This means you just created $200,000 in value into your building with a small change in operations. Now here's the fun part. What if you didn't even change anything in your building, but investors were willing to take a lower return for your $100,000 Net Operating Income? (Original Example) What if the cap rates in the area were lowered to 9% because commercial real estate is a hot investment in your area/country? Your building just increased in value by $110,000 just because investors were willing to take a lower return. This is what happened between 2002-2007 as commercial real estate was smoking hot. Investors were paying a 2-3% return for the Net Operating Income, which created huge paper gains on the buildings. Over the next 48 months commercial buildings are going to flood the market in a manner not seen since 1990, only this time I believe it will be much worse. There is no Fannie Mae or Freddie Mac that the government can socialize to create new loans for commercial real estate. Lending restrictions will severely tighten up, creating massive losses for banks that purchased these mortgages, and enormous bargains for investors entering the market. I prepare every day for this coming opportunity. To prepare I work on my ability to increase income/lower expenses on a building, understand the direction of cap rates/capital movement, and align myself with investors who will have the capital to make purchases when the time is correct. We have a new president America. He has promised you a change, and I assure you a change is coming. Let's talk about what we can look forward to. Obama enters his presidency at a historic moment in time. Our entire country has experienced a 25 year economic boom fueled by credit and debt. Every year it seemed things could only get better, and every year the debt grew larger for Americans and the country as a whole. Unfortunately, what goes up must also come down. A boom fueled by credit is what can be described as phony, for lack of a better word. The country experienced a glimpse of what our economy truly is in October, when the stock market fell over 20% in a single month. Many people who do not watch their accounts week by week will be opening up their statements in the mail this month to an unpleasant surprise. A change. While the phony inflated stock market values of American's 401Ks can be ripped away in the blink of an eye, the real estate market works in a different manor. Astonishing surveys taken over the past few months show that about 75% of Americans think that their home has stayed equal or gone up in value over the past year. Many still feel that their homes will sell at 2006 prices, only to find out what their home is really worth when they put it on the market. I know this because I see it every day in my business. The true prices of homes right now are what they are selling at in foreclosure. Coupled with this decrease in asset wealth will be mass layoffs over the next 18 months. These appear to be coming across the board in every industry, but real estate and finance in general are the true slaughterhouse. Unfortunately, those two industries were the main growth of employment over the past ten years. Where will those employees work when they're out of business and they realize that the housing and financial industry will not be back for many years? Very good question. They will feel the change as well. As assets and wages fall, the real pain will come from the other side in the cost of living. The temporary pull back in oil has comforted Americans with the fact that the oil "bubble" has finally burst. Unfortunately, no one has told them truth about supply and demand. The global demand for oil this year will grow by about 1% and the supply is falling. To counter that punch, the number of dollars entering the system is surging at a rate almost unfathomable as the supply of oil falls. As I've said before, prepare yourself for some remarkable prices for oil over the next 18 months. A change if you will. Oil will be teamed with its partner agriculture(food pricing) which will follow a similar pattern of supply and demand, only possibly more severe in the short term. The cost of food and gas will take away any available "free" spending money for additional goods. Our lifestyle will be put first onto the credit card as it is now, and as that is taken away it will leave nothing left for consumption, which makes up 72% of our economy. Remember, our economic model is foreign countries working hard to send us money so we can buy things. That will end after this crisis. A change in living standards is coming. This will all have a snowball effect as home loans, credit cards, auto, commercial real estate, and business loans are all defaulting at the same time. It will begin to overwhelm the financial system with defaults. For these reasons, over the past few weeks all the banks have essentially been nationalized to prepare for this coming storm. If this had not taken place, the credit default swap market would be a weekly time bomb set to explode, which would have the effect of shutting down all the major banks who send billions to our politicians. This is obviously not acceptable and a change was needed fast. So the banks will be saved and the cost will be sent to the already decimated American public. It will be sent to them weekly in the form of inflation. Every week they will be taxed with a higher gas price, food price, clothing price, ect. Obama will stand ready to send them additional stimulus checks to cover these costs. Of course, these additional stimulus checks will only increase the cost of living thus cancelling out any positive effect. They will send more, and more, and more. Then you can expect price controls, and then you can expect tax hikes, the two most destructive things any country can do to its people. What will ensue will feel like a hyperinflationary depression. All remaining wealth will be transferred from the hands of the poor and middle class to the wealthy and foreign countries as our currency collapses in value. The wealthy will be holding assets that will keep their value, and foreigners will be holding currencies that have increased in value. All the cars, televisions, and homes that they lent to us on borrowed money will then be returned to them at incredible pricing. We will just be left with the debt for those products. Obama stands ready to take the fire that blazes across our country and send air crafts to dump gasoline. Yes sir, get ready for a change. 2009 = 19 - - ?